With Napoleon massing an invasion force on the French coast, English Admiral Horatio Nelson sailed home to prevent assault on the British homeland. When the Treaty of Amiens was signed on April 1, 1802, bringing peace between France and Great Britain after nearly a decade of war, there was wild rejoicing in England. In London, there were even scattered shouts of “Long Live Bonaparte.” The elation, unfortunately, proved to be short-lived. The treaty ended active hostilities but did little to curb Napoleon’s dynastic ambitions on the European continent, where he had already annexed Holland, the Piedmont, and the Mediterranean island of Elba. In addition, French troops had overrun traditionally neutral Switzerland and forced it to accept a constitution dictated by Napoleon. For the first time, Napoleon began to seriously consider an invasion of England. As early as 1801, before the Treaty of Amiens, he had threatened such an attack, but the English downplayed the threat, expecting any move against the homeland to be at most an armed raid on London, not a full-fledged invasion. With the abrogation of the Treaty of Amiens, however, Napoleon began mobilizing his forces along the French coast of the English Channel. Now was the time—the continent was relatively calm, and French armies were not needed elsewhere. The proposed invasion was to consist of three basic elements: a flotilla large enough to ferry an army across the Channel, appropriate facilities and fortifications for the ships needed to transport the troops, and a massive invasion force capable of storming the English beaches. Preparations began with improvements to the port of Boulogne and the building of the invasion flotilla. Napoleon had little experience with naval matters, yet he resisted delegating even the smallest details of the preparations. He decided on flat-bottom boats against the advice of his senior naval commanders, who feared that they would be lost crossing the notoriously treacherous Channel. He proceeded to award contracts for approximately 1,050 of these boats, with delivery of the first 310 by December 23, 1803. At least part of the financing for the ship-building was to come from wealthy private citizens, who were asked to donate a minimum of one vessel each. The boats so procured would be named after the donors. The invasion flotilla was made up of four distinct types of craft. First was the prame, a 110-foot vessel with a 25-foot beam and no real keel. This shallow-draught vessel, with its heavy rigging, was the most unstable in heavy weather. It had a complement of 38 sailors and 120 soldiers and was armed with 12 24-pound guns. The chaloupe canonniere was an 80-foot boat with a beam of 17 feet. It was armed with three 24-pounders and one eight-inch howitzer, and carried 152 men, including a crew of 22. The bateau canonniere was 60 feet long, with a beam of 14 feet. It carried one 24-pounder, one howitzer and one piece of field artillery, and sported a crew of six and 106 soldiers. The final class was the peniche. This was the smallest of the landing craft. It was 60 feet long, with only a 10-foot beam and no decking. It carried 71 men, including a crew of five, and a four-inch howitzer. The final two classes of boats proved to be the most numerous. 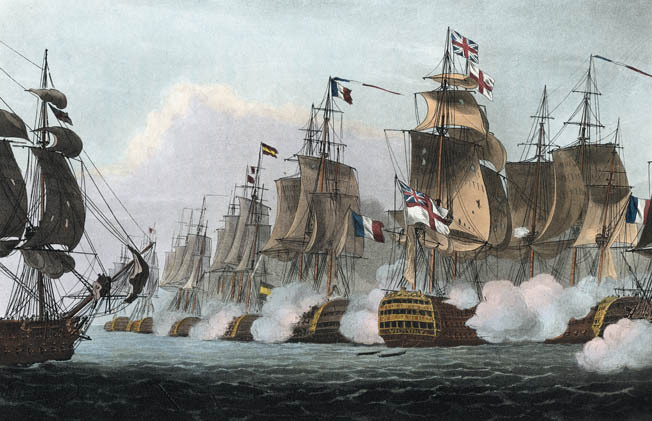 The British Navy blockades the French Fleet. By the end of 1803, orders had been placed for approximately 1,300 vessels. In addition, 180 existing boats could be used, as well as approximately 700 transports, which had been built for fishing. The fleet was commanded by experienced Admiral Eustace de Bruix, who estimated that he could deliver an army of 114,000 troops to the south of England. Already, Napoleon was amassing these troops in camps spread along a 75-mile stretch of the French coast from Calais to Boulogne. By the summer of 1804, three army corps, totaling some 10 divisions, were ready for action. The camps were plainly visible to English eyes from the famous white cliffs of Dover, sending a collective shiver through the civilian population living on the coast. For years they had been making their children behave by reciting a nursery rhyme that warned them that Napoleon, “tall and black as [a] Rouen steeple,” would tear them “limb from limb” if they did not mind their parents. Each step taken by Napoleon was carefully observed by the British Navy, which blockaded the French fleet and dared it to venture into the open seas. In addition, the English repeatedly shelled the installations around Boulogne. At home, the government prepared for the threatened enemy invasion by forming volunteer units to defend the beaches, as well as drawing up elaborate evacuation plans for the women and children. A string of squat, bunker-like Martello towers was erected along the southern and eastern coastlines, and fortifications were strengthened along the Medway and Thames Rivers to prevent another penetration up the Thames Estuary like the one accomplished by the Dutch in 1667. In London itself, a register was drawn up of laborers, smiths, carpenters, and gardeners who could be called upon at a moment’s notice to construct deep ramparts and ditches for artillery defenses. 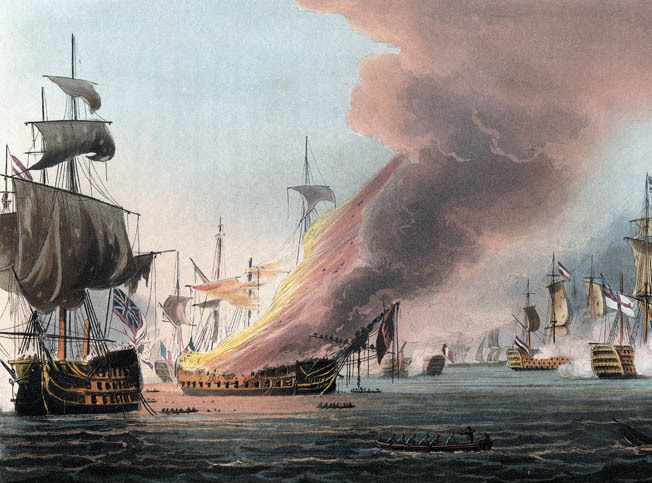 Napoleon’s plans called for naval squadrons to protect the invasion flotilla, and this meant ending British naval dominance of the English Channel, at least temporarily. In 1804, Napoleon wrote, “We have 1,800 gunboats and cutters carrying 120,000 men and 10,000 horses between Etaples, Boulogne, Wimereux, and Ambleteuse. If we are masters of the Channel for six hours, we are masters of the world!” That would prove to be easier said than done. The renewal of the war posed a serious challenge to the British, who now were menaced by the combined sea power of France and Spain. When the Spanish, at Napoleon’s insistence, declared war on Britain on December 12, 1804, the Combined Fleet, at least quantitatively, had the capability of seriously challenging the British on the seas. The problem of blockading the allied Franco-Spanish navy to forestall its support of an invasion became more complex, because Napoleon’s ships of the line were based in a larger number of ports. As long as the western mouth of the Channel was in English hands, however, Napoleon could not successfully invade, no matter what the size of his combined forces. The French leader understood this full well. He needed to create a diversion to temporarily ensure Allied naval supremacy in the Channel and cover his invasion force. On December 4, 1804, he ordered Admiral Pierre de Villeneuve, his senior admiral afloat, to break out of the port of Toulon and sail for the West Indies. He was to be joined by Admiral Edouard Missiessy, after the latter avoided the British blockade of Rochefort. Villeneuve was to stay in the area for 60 days and do as much damage as possible to British possessions before heading back to Europe. Napoleon’s calculation was that the British, impressed by the near-simultaneous departure of two French fleets and uncertain about the enemy’s purpose, must send at least 30 ships in pursuit. This diversion would facilitate the operations of the Brest fleet, under Admiral Honoré Ganteaume, which would then land an advance army corps in Ireland and cover the crossing of the main body of French troops from Boulogne to England. The greatest roadblock to Napoleon’s ambitious plan of conquest was an old and all-too-familiar enemy—Admiral Lord Horatio Nelson. The 47-year-old Nelson had long been a thorn in the emperor’s side. A native of Norfolk and a distant relative of Sir Robert Walpole, Britain’s first prime minister, Nelson had gone to sea at the age of 12. He advanced rapidly through the ranks, seeing duty in the West Indies, the Revolutionary War, the Caribbean, and the Mediterranean, where he assumed his first command as captain of the 64-gun Agamemnon. He helped defeat the Spanish fleet at the Battle of Cape St. Vincent in 1797, and the next year he won a great victory over the French at the Battle of the Nile, which effectively ended Napoleon’s ambition to make war on the British holdings in India. Nelson was a brilliant commander, but also a rather unlucky one. He was shot in the back during the siege of Bastia, Corsica, in 1794, and lost the sight in his right eye after being struck by stone fragments at the Battle of Cape St. Vincent three years later. He had his right arm amputated after being shot in the elbow by a musket during an unsuccessful attempt to conquer Santa Cruz de Tenerife. At the Battle of the Nile he suffered a concussion, bruised face, and lacerations over his good left eye. In addition, he was plagued by an abdominal hernia caused by another wound, as well as the 18th-century sailor’s regular afflictions of ship fevers and malaria. His much-publicized love affair with Emma Hamilton, the wife of the British ambassador to Naples, was a self-inflicted wound that likely had an adverse effect on his career as well. When Nelson heard that Villeneuve was on his way to the West Indies, he vowed to pursue him at all costs. By the beginning of June, he wrote that he was “within six days of the enemy.” However, the Combined Fleet was nowhere to be found. Nelson continued his search, island by island, but could not locate the French ships and returned to Gibraltar on July 20, 1805, setting foot on dry land for the first time in two years. Meanwhile, Villeneuve arrived at Martinique and remained largely inactive. When he learned that Nelson had exited the Mediterranean and was pursuing him, however unsuccessfully, he panicked and, in the company of his Spanish allies, headed for the open spaces of the mid-Atlantic. Although he hoped to avoid contact, Villeneuve’s goal was frustrated when he encountered a squadron of 15 British ships of the line commanded by Vice Admiral Sir Robert Calder on July 22, about 90 miles off Ferrol. During the ensuing battle, two Spanish ships were captured, but the encounter was otherwise indecisive. Calder hesitated to renew hostilities, and lost sight of the French on the 26th. Two days later, the Franco-Spanish fleet safely entered Vigo. On August 1, they slipped into Ferrol, farther north, before doubling back to Cadiz. Napoleon’s plan to have Villeneuve divert the British fleet while he moved his invasion flotilla across the Channel had been thwarted, almost inadvertently. Ironically, Calder was censured for not doing more to destroy Villeneuve’s command, and was ordered back to Portsmouth to face court-martial. He was exonerated of cowardice but reprimanded severely. In this painting we can see the British, French and Spanish flags atop the mast’s. Later that summer, Villeneuve was ordered to return to the Mediterranean. When Napoleon’s naval leadership pointed out the danger of this move, he replied brusquely that the Navy had failed him. “His Majesty counts for nothing the loss of his ships,” his order read, “provided they are lost with glory.” Obediently if grudgingly, Villeneuve sailed for the Straits of Gibraltar and the Mediterranean. Napoleon, about to initiate his victorious Ulm-Austerlitz campaign against Austria, wanted the Combined Fleet to attack Austria’s ally, Naples. To prevent one side from deserting the other in time of peril, the two nations’ ships were intermingled in line of battle. Meanwhile, Nelson had been given leave and sailed for Portsmouth aboard his flagship, Victory. He returned to his home (and Mrs. Hamilton) on August 22, 1805. However, on September 13, he re-embarked on Victory, being rowed off the beach to avoid the adoring crowds waiting at the dock. He arrived off Cadiz on September 27 and immediately took command of the British blockading fleet of 22 ships of the line. At his first meeting with his captains, Nelson outlined his plan of attack, which he termed without false modesty “The Nelson Touch.” This plan became an order, which was issued to the fleet on October 9. At 8 am on October 21, Villeneuve became aware of the pursuing British fleet and reversed his order of sail, heading northward back to Cadiz. Nelson continued to close in on him, and by dawn of the 21st, the English fleet was nine miles directly to windward of its opponent. As the sun rose over the horizon and there was sufficient light for signal flags to be seen, Nelson ordered his fleet into battle formation. In accordance with his plan for “the Nelson Touch,” it formed into two columns. The largest and most highly situated battleships headed the columns, since they were best able to absorb damage, had the weight to break up the enemy line, and carried the most guns to take on concentrated enemy firepower until the ships behind them arrived to help. The northern column under Nelson contained the ships Victory, Neptune, and Temeraire, followed by nine two-deckers. The southern column was commanded by Admiral Cuthbert Collingwood in Royal Sovereign. The plan to break the enemy line would naturally allow the enemy to cross his “T” during the approach, causing potentially frightful damage. But Nelson was prepared to pay the price for what he considered his inevitable success. To restrict the damage from a head-on attack against the enemy, however, he intended to get in among the enemy as quickly as possible, ordering his ships to carry full sail and extra studding sails until they reached the enemy line, instead of the normal fighting rig of topsails only, which would avoid the mainsails from being set afire by stray gun flashes. Villeneuve correctly ascertained that Nelson would not fight an orthodox line-against-line battle, but instead concentrate against part of his fleet. To counter this, the French admiral formed a “fast squadron of observation” under his second-in-command, Spanish Admiral Don Federico Gravina, that was to act separately from the line of battle wherever it was needed. Furthermore, he instructed all his captains to join the action as soon as possible, and urged them to use aggressive boarding tactics to counteract the superior British gunnery. In this he was frustrated by Gravina, who tamely attached his ships to the rear of the line (where he saw that Collingwood was aiming), rather than using his freedom of action to maneuver against Collingwood’s flank and disrupt his attack. A second message, directed to the less-exalted sailors and marines in his fleet, became the most famous signal in naval history. As transmitted by Lieutenant John Pasco, chief signalman on Victory, it declared bluntly: “England expects that every man will do his duty.” The wording troubled some of the men, who interpreted it as a subtle slur on their sense of devotion. Marine Lieutenant S.B. Ellis read the signal to his men aboard Ajax, “rather anticipating that the effect on the men would be to aw them by its grandeur.” Instead, the men grumbled, “Do our duty! Of course we’ll do our duty! I’ve always done mine, haven’t you? Let us come alongside of ‘em and we’ll soon show whether we’ll do our duty.” In actuality, Nelson’s original message had been changed, at Pasco’s urging, from the more positive and personal: “Nelson confides [is confident] that ever man will do his duty.” As Pasco explained, the word “expects” was in the signal corps vocabulary, while “confides” would have to be spelled out. Another officer suggested that England would be more powerful than Nelson—a debatable proposition, given the admiral’s universal popularity among the men who sailed under him—and the revised message passed instantly from ship to ship. British naval officer. 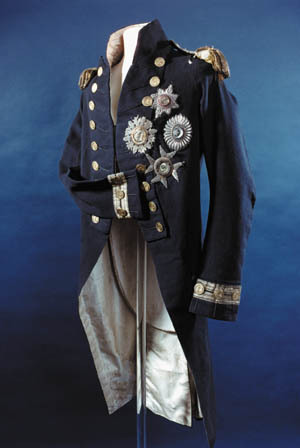 Uniform coat worn by Horatio Nelson at the Battle of Trafalgar, 1805. Hardy chose the 80-gun Bucentaure, which happened to be the French admiral’s flagship. As Victory passed across her stern, Hardy’s gun crews fired a devastating broadside through her cabin windows, raking the length of her gun decks. Shots and splinters hurtled though the smoke as the ships on both sides exchanged a ferocious fire across the narrow stretch of intervening water. The enemy ships were now so close to each other that Victory crashed into a French vessel lying astern of Bucentaure, the 74-gun Redoutable. Victory rocked away at the first contact; but her yardarm became entangled in Redoutable’s rigging. The English gun crews worked their cannons, firing from the starboard side into Redoutable, and on the port side into the immense Spanish ship, the 140-gun Santisima Trinidad. As Victory advanced, enemy shots were flying thickly against the British flagship. Barrages tore into Victory’s sails, ripping away bits of canvas and flinging them across the quarter deck. The first British ships going into action took the bulk of casualties as they found themselves surrounded by the enemy. However, as more British units entered the newly opened gaps in the Allied line, their superior gun drill and mutual fire support proved decisive. Admiral Pierre Dumanoir in Formidable, commanding the Allied van, was deceived by Nelson’s initial feint before attacking the center. Consequently, he was late in ordering his ships to turn back against the attack, a movement further delayed by the light wind, which necessitated launching his ships’ boats to tow them around. Victory struck the enemy’s center and broke through the French line, battling savagely with Temeraire, Bucentaure, and Redoubtable. Hardy again asked Nelson if the four badges of chivalry on the admiral’s coat might not make him too conspicuous, and Nelson answered that no doubt it was true, but there was no time for him to change. Meanwhile, the French ship Neptune raked Victory’s bow. The planned confusion, which was the stated intention of “The Nelson Touch,” was taking place. Redoutable and Victory were firmly held together by an entanglement in their rigging, but the intense nature of the battle made boarding by either crew impossible. Sharpshooters on platforms above the main yards of Redoutable took aim at the crew members on Victory’s quarterdeck, which they could glimpse briefly through the swirling smoke. At this point, a counterattack by the Franco-Spanish van led by Dumanoir was beaten off by the British northern segment of ships. In accordance with Nelson’s calculations, the French and Spanish ships were proving to be no match individually for the British, as the Allied ships struck their colors one after the other. Villeneuve, in despair, tried to rally his men aboard Bucentaure, grabbing the imperial eagle and threatening: “I am going to throw this on board the English ship. We will go fetch it back or die.” The threat was an empty one. Victory did not come close enough for Villeneuve to throw anything onto her, but in passing she let loose a cannon shot loaded with a keg of 500 musketballs that completely devastated the French upper deck. Hardy came below to comfort Nelson and congratulate him on the apparent victory. He informed Nelson that 14 or 15 enemy ships had already surrendered. “That is well,” said Nelson, “but I bargained for twenty.” He implored Hardy not to throw his body overboard, and the captain replied, “Oh, no, certainly not.” Nelson’s last thoughts were of his lover. “Take care of my dear Lady Hamilton, Hardy,” he said, “take care of poor Lady Hamilton.” Hardy promised he would. “Now I am satisfied,” said Nelson. “Thank God, I have done my duty.” Hardy went back on deck, and Nelson lapsed into speechlessness. A few minutes later—the exact time is unknown—he died. “I believe His Lordship has expired,” said the ship’s steward. Nelson had turned 48 three weeks earlier. Another unlikely survivor of the battle was 46-year-old Irish master’s mate James Spratt, who led a party of boarders from Defiance onto the French ship Aigle. Holding his cutlass between his teeth in best pirate’s manner, Spratt called for his comrades to follow him, leapt overboard and swam to the enemy vessel. He climbed aboard Aigle and fought his way through various decks before he reached the French colors and attempted to haul them down. Fighting off several grenadiers, Spratt turned to meet a French soldier who was attempting to bayonet him. He struck down the musket, but the gun went off and a ball struck him just below the knee, shattering both bones in his leg. Holding his bleeding limb over the rail of the French boat, Spratt called out, “Captain, poor Jack Spratt is done up at last.” Taken back aboard Defiance, Spratt refused to allow his leg to be amputated. Against all odds, he recovered, spending 17 weeks in a Gibraltar hospital before returning to England, where he was given a sinecure at a Devon telegraph station and lived to the ripe old age of 81, amazing everyone with his continuing ability to swim in the ocean with one good leg. One Spanish ship was sunk during the conflict. After five hours of fighting, the battle came to an end. In all, 17 French and Spanish ships were captured and one sunk, and some 7,000 casualties were inflicted. Another 15 Allied vessels managed to limp away, including the French ship Formidable, commanded by Admiral Pierre Dumanoir, who enraged both English and Spanish sailors by firing into Spanish vessels that had already surrendered. The Spaniards aboard one of the surrendered ships, Argonauta, were so angry that they immediately offered their services to the British officer in charge of taking over their boat. Their weapons were returned and they were stationed at the lower deck guns, where they continued fighting against their erstwhile allies. British Captain Edward Rotheram, aboard Royal Sovereign, witnessed Dumanoir’s act and pronounced it “worthy of the days of Robespierre.” Several months later, after he had been taken to London as a prisoner of war, Dumanoir actually wrote a letter to the London Times denying that he had deliberately fired at his allies, although he conceded that a few “stray shots” may have hit them. His denial was received skeptically by most readers. Collingwood dispatched the schooner Pickle to carry the news of the great victory back to England. (Legend has it that Collingwood chose Pickle for the honor as a way of repaying her commander, Lieutenant John Lapenotiere, for having saved his life years earlier after a shipwreck.) It took Lapenotiere nine days to reach England. He arrived on the somewhat inauspicious 200th anniversary of Guy Fawke’s Day, when rebels had attempted to blow up Parliament. For the rest of their lives, English men, women, and children remembered what they were doing when the heard the news of Nelson’s victory at Trafalgar. Many, including Prime Minister William Pitt, were so stunned that they could not sleep. King George III was awakened with the news at half past six the next morning, and members of the royal family burst into tears. Emma Hamilton was still in bed when messengers from the Admiralty were ushered into her bedroom. The look on their faces was enough to cause Nelson’s infamous lover to scream and fall into a 10-hour swoon. Her first words, when she finally spoke, were: “What shall I do? How can I exist?” Hundreds of other women, widows or possible widows themselves, descended on the Admiralty to ask the same questions of naval officials there. Napoleon, who already had turned his back on the Navy before the battle, was unusually reticent upon hearing of the French defeat at Trafalgar, although he expressed admiration for the fighting qualities of Nelson. The day before Trafalgar, he had won another great victory of his own at Ulm, Germany. Frederic de Borrienne, the private secretary to the emperor, wrote: “Napoleon received at Vienna intelligence of the disastrous battle of Trafalgar. In France, that event was only known by report, and through the medium of the foreign newspapers, which were then prohibited. So completely did Napoleon succeed in veiling that disaster in obscurity, that previous to restoration it was scarcely known in France. Napoleon was profoundly afflicted at this event, but at the time he did not express his mortification.” The emperor immediately drafted orders for the French fleet at Brest to Revenge the Trafalgar disaster, but cooler heads eventually prevailed and Napoleon countermanded the order. Trafalgar ended any real threat of invasion of the British Isles. To the very end, Napoleon believed that his naval leaders had failed him. The finality of the Battle of Trafalgar was symbolized by the fate of its three leading admirals: Nelson was killed, Spanish Admiral Gravina died of his wounds, and Villeneuve perished under highly questionable circumstances after being exchanged and returning to France. Alleged to have committed suicide, the disgraced admiral was found dead in a locked hotel room, with six stab wounds to his chest and heart. Many people, then and later, suspected that he had been murdered by agents of Napoleon who wished to silence a possible critic and embarrassment to the emperor. The “annihilation” battle that Nelson had sought was largely achieved, since more ships of the line were taken than in any previous battle of the sailing era. But the immediate effects of Trafalgar were limited. It prevented the Combined Fleet from interfering in Mediterranean operations, but those operations—the Russo-British invasion of Naples—were themselves invalidated by French victories at Ulm and Austerlitz. Trafalgar did not stop Napoleon’s march through Europe, but it did prevent any resumption of his westward ambitions. It also gave the British breathing space to rebuild their deteriorating fleet and encouragement to continue the fight despite the setbacks of their allies. Tags Admiral Cuthbert Collingwoo, Admiral Don Federico Gravina, Admiral Honore Ganteaume, Admiral Horation Nelson, Admiral Pierre de Villeneuve, Battle of Cape St. Vincent, blockade, Blockade of Cadiz, Boulogne, British blockade of Rochefort, British Royal Navy, Bucentaure, Captain Henry Blackwood, elba, English Channel, French Navy, hms royal sovereign, hms victory, Invasion of England, John Scott, Mediterranean, Naples, Napoleon Bonaparte, Napoleonic Wars, redoutable, Spanish Navy, Straits of Gibraltar, treaty of amiens.